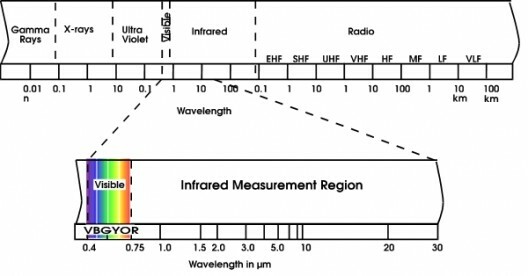 Infrared (IR) energy is light that is not visible because its wavelength is too long to be detected by the human eye; it’s the part of the electromagnetic spectrum that we perceive as heat. Every object above ‘Absolute Zero’ emits electromagnetic radiation or heat. The higher the object’s temperature, the greater the Infrared radiation emitted. Infrared thermography cameras allow us to see what our eyes cannot see. A thermography infrared camera is a non-contact device that detects infrared energy (heat) and converts it into an electronic signal, which is then processed to produce a thermal image on a video monitor and perform temperature calculations. Heat sensed by an infrared camera can be very precisely quantified, or measured, allowing you to not only monitor thermal performance, but also identify and evaluate the relative severity of heat-related problems. When water/moisture exists in a building, it heats up faster or slower than in surrounding materials, thus letting the infrared camera pick up the difference in temperature. On completion of the City Line IR inspection the images will be analysed and you will be provided with a comprehensive report of the results.